There is a mystery in archaeology that numerous regions and eras have to deal with- where are the infants? Deceased infants are potentially treated differently when they die- the argument over whether the Romans discarded deceased newborns is a good example of this. When excavating primary cemeteries in some regional eras, such as Ancient Rome or Greece, we rarely find the remains of infants. Given that infant mortality was high in the past, the lack of remains is odd. There are a number of potential hypotheses regarding this contradiction between the archaeological record and historic texts reporting high infant mortality: 1) Infants are buried in separate cemeteries, 2) due to their fragility, infant remains degrade quickly in soil and rarely preserve, or 3) infant remains when properly cremated are completely destroyed in the process and cannot be identified. It is this final possibility that we are interested in today. Cremation in general has been understudied due to the perception that the remains found are archaeologically poor- what this means is that it is much harder to identify individuals and learn about the population when they are cremated versus buried without treatment by fire. However, in the past couple decades there has been increased attention paid to the process of cremation, methods to better interpret the cremains, and theory has been developed. Experimental archaeology has been a great help in better understanding how cremation in the past occurred. By studying modern cremation and conducting experiments using pig remains (which are supposedly similar to human remains) we have learned more about the colors the bones change when exposed to heat, how the bones crack and warp, and what temperatures need to be maintained to cremate a whole body on a wood pyre (For summaries of these findings, check out this post). However, there are still many questions when if comes to cremation, especially regarding infants. 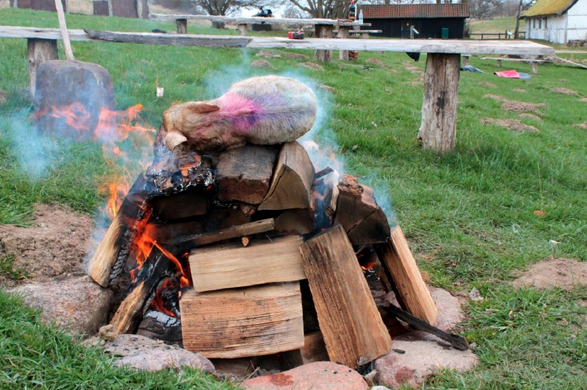 A new study by Jæger and Johanson (2013) conducts an experimental cremation of three piglets aged from three days to one week in order to investigate this problem. The piglets were a range of weights from 2000 grams to 6000 grams, weights that are representative of the extremes of the weight spectrum that would be found in children under one year old. The pyres were constructed only from wood, and were done as simply as possible. Temperature was measured beneath the piglet throughout the cremation. Once the fire was done, the remains were covered in plastic and left overnight to cool. All intact remains from the piglet, including bone, flesh and ligaments, were collected and taken to their lab for final defleshing and cleaning. The results of the study showed that the skeletal remains of the piglet made up between 2.18 and 3.28 % of the original weight prior to burning. This fits with similar findings for infant human remains when done at modern crematoria- though the remains of the piglet were slightly more intact than modern infant cremation due to the conditions of a pyre versus professional crematoria. Jæger and Johanson (2013) argue that based on this experiment, infant remains would be able to withstand the thermic stress of a cremation. They conclude that we should look to socio-anthropological sources of difference in burial- not preservation as the reason for low infant remains in the past. They propose that it is likely that cultural conditioning caused treatment and burial of deceased infants to be done differently from adults, and it is likely that we’re just not looking in the right places for them. They end with the hope to continue these experiments under different condition such as wrapping the body in linens or burning the piglet directly on the ground instead of raised on a pyre. I appreciate these types of studies because they investigate assumptions. There had been an assumption that little to no infant remains would be found after cremation or that they were poorly preserved and that is why we don’t find them. This is one more detail to add to the question of where are the infants. As we slowly learn more about how the human body reacts to different types of funerary treatment we can help fill in what happened in the past. It will be interesting to see what they do in the future! Crazy idea but is it possible that a culture might not consider an infant under a certain age as a person per se, and therefore not treated postmortem with the same ritual, burial, etc.as older individuals? That’s exactly correct! Due to high infant mortality, it was common that an individual didn’t become considered a full member of society until they were a few years old. Quotes from Ancient Rome support that at least 2 years and below they weren’t really full social members. That doesn’t mean it wasn’t emotional- it was just more common and a way of emotionally protecting people. Yes, but. A little bit of identifiable infant bone (pig bone) is preserved immediately after a cremation fire. That is good to know. However, the preservation question does not end there. Put that little bit of bone in wet soil for 2,000 years, like in the Middle Woodland Period when cremation and burial was fairly common, what happens to it then? It is already a small amount of bone anyway after cremation. Will it be something that a troweling field school student would recognize as a burial or just random looking flecks of “something kind of ash-like” in pebbly soil? There is also the association of water with life in many human cultures. It makes me wonder whether cremated infant remains were committed to bodies of water in some cultures as an affirmation of life in the context of death. I was just browsing though Reddit, and found a link to your blog. I must say, when we did the experiments almost a year ago we never thought that our experiments would get as much attention as they did much less outside of Denmark or our own university. Even when we got the article published in a small portuguese journal we only hoped that a few geeks somewhere would find it. So thank you very much for finding our research interesting and useful. Thanks for the comment- the article actually been picked up by Smithsonian, so hopefully you’ll be getting quite a bit of press! If you have any other article you want to share on the subject, I’d be glad to blog about them! Sadly I don’t. This is pretty much the first research project I’ve been on. But I’ll be sure to notify you next time I set something on fire!